ATLANTIC—One of Atlantic’s enduring establishments will soon be returning to the city of Luna. A Blind Man’s Outlet, founded in 2007, is known for its consistent supply of needful goods, available for purchase at affordable prices. The Outlet has sold its wares in several locations over the years, perhaps most notably at the historic Treasure Trove. After a brief period in Zento, the shop is now returning to its original plot in Luna and is scheduled to open on Sunday, 11 October 2009. In anticipation of the Outlet’s Luna re-opening, I sat down with the Outlet’s proprietor, A Blind Man, a.k.a. Static, to learn more about his establishment. “What would my customers DO without ME?” he joked. Like many former players, A Blind Man found it difficult to forget about UO. 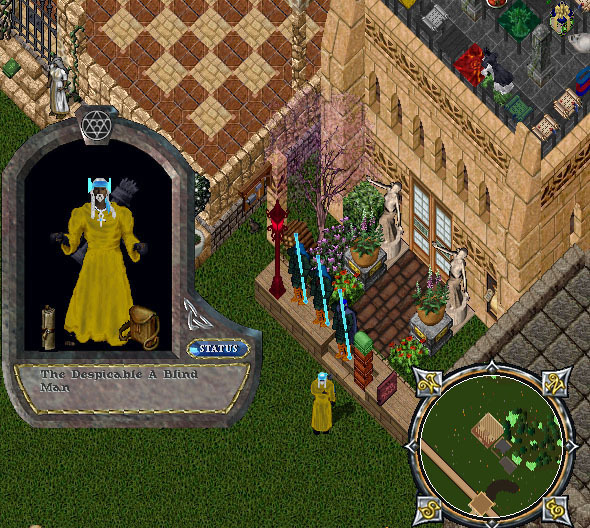 Most Atlantians know A Blind Man for his business ventures, but others remember him for his more devious exploits: a few of his adventurers as a professional pickpocket are published on UOThief.com. I asked A Blind Man if he had any plans to return to the shadowed alleyways of Britannia. In light of real-life concerns, he was unable to continue with THIEF. Instead, he decided to try his hand as a full-time merchant. 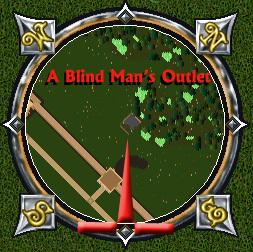 Upon his return to UO, A Blind Man acquired a Zento house and resumed business as usual, but when the opportunity arose to purchase his original vendor plot in Luna, he jumped at the chance. Luna vendor rentals are in high demand, due to their convenient location. I asked A Blind Man if he planned to rent vendor spots. Concluding our interview, I asked A Blind Man if he had any last remarks. A Blind Man wished to add the following thank-you. A Blind Man is a full-time Sherriff’s Deputy and “Closet Nerd.” He has been playing UO since 1999. His vendor shop, A Blind Man’s Outlet, will open in Luna on Sunday. Directions to the new venture can be found on the Atlantic Forum under the News Post of the same name.